Objective: The purpose of the Breastplate of Righteousness, Gospel of Peace. What does the Armor of God do for us? What does the breastplate cover? What do the Gospel of Peace shoes help us tell others? Verse: Mark 16:15 (NIV) - Go into all the world and preach the Gospel to all creation. Go- into all the world and preach the Gospel. Mark 16 verse 15, preach to all creation. By doing the right thing, you can keep sin away from your life. Cut out the Breastplate of Righteousness worksheet and color the heart red. Glue small pieces of aluminum foil on the breastplate around the heart. When we understand the Good News (Jesus died for our sins, arose from the grave, and is in Heaven preparing a place for us), then we have peace and do not need to be afraid. Ephesians 6:15 says, "For shoes, put on the peace that comes from the Good News so that you will be fully prepared." We can take a step without fearing of what will happen because we know God is in control. With the shoes on we can tell others the Gospel and Good News of Jesus. Color the Gospel of Peace Shoes worksheet. Poke out the holes and help the child lace with a string and tie. 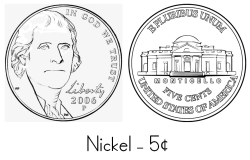 The nickel is worth 5 cents (1/20th of a dollar). The nickel contains the profile of Thomas Jefferson, the third President of the United States. The back of the nickel has a picture of Monticello, Jefferson's house near Virginia. "E PLURIBUS UNUM" means "Out of many, one." Examine the coin with a magnifying glass. You’re worth five. I know that. - Coin Rub: Tack down two nickels - one heads up, one tails up. Place a piece of paper over the coins. Using a silver crayon, color over the coins to make an impression. - Color the Nickel worksheet silver. - Find a Coin: Hide a few pennies and nickels in a tub of shredded paper or oatmeal. Have the child name the coin and say the correct rhyme for the coin found. Taking safety precautions can keep accidents from happening. Each day, discuss a few of the following examples explaining why each of these is important to keep you safe. Roll play with two dolls making the child be the "adult" doll. Have the "child" doll break safety rules and ask the "adult" to explain to the "child" why the choice is not a good one. To end each day, have the child draw a picture of himself doing something safe. - Play doctor with a Doctor Set and Doctor Costume. Doctor another person or stuffed animal. Bandage with ace bandages. 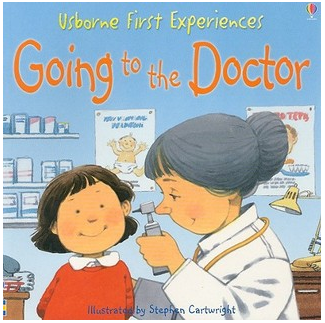 Have a pretend doctor visit by taking the child's weight, temperature, and height. Ask the child fun doctor-type questions. "Bandage" the Boy and Girl worksheet with bandaids. Glue on gauze and cotton balls. Use the Vv Writing worksheet and for further learning check out the Letter V Activities. Practice writing numbers 0-25 using the Write Numbers 0-25 worksheet. Fill in the missing numbers. Using the Book Summary worksheet, draw pictures to represent the beginning, middle, and end of Mercy Watson to the Rescue. - Teach the child to make buttered toast. Use this time to explain that you never stick a knife in a toaster that is plugged in. - Make homemade butter. Google for directions. - Play tag and pretend you are Mercy running away from the people. 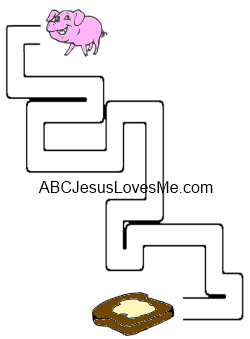 - Help Mercy Watson find his toast in the Mercy Watson Maze.